My kids school is having a creative awareness week in the beginning of April. That week students can display artwork in painting, photography, drawing, sculpture, etc.. and it will be displayed on the wall at school. New this year they're having relatives of the students who also are creative in these areas setup and display their work for a day. I'm displaying everything as if I was going to one of my shows and I'm also taking my sewing machine for demonstrations. I haven't decided what I'm sewing yet maybe a quick coin purse with a zipper. Recently I've been experimenting with block printing. 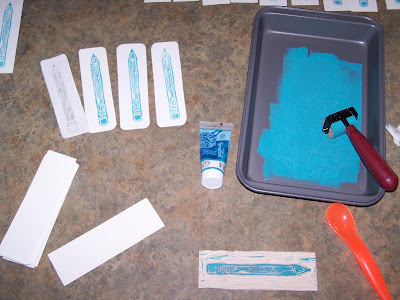 I wanted to make something for all 490 kids and needed something fast and inexpensive. Kids love free stuff! I drew and cut out my interpretation of a wooden pencil and decided on bookmarks. At Boston Handmade's material swap this past summer I got a lot of this white heavy paper brought by Dawn of creatively anew. I've been using my dad's paper cutter and calculated a certain amount to do everyday. My kids think they're cool so I hope the 488 others think the same. OMG! 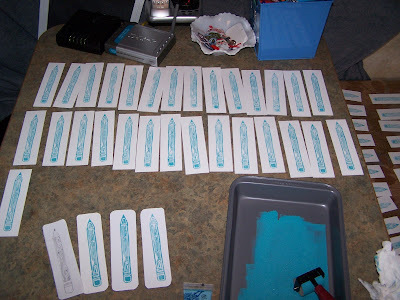 I can't believe you are making a bookmark for every student! You are amazing!! !